Damask Fabric originated in Damascus, the city from which its name is derived. Damask uses one of the fine basic weaving techniques of Byzantine and Islamic weaving centers from the early Middle Ages. Damask was invented before the ninth century. Today many other countries make (weave) damask. The weave of the fabric is what makes damask fabric so special. Other fabrics are woven in an up/down or vertical/horizontal manner. Damask is interwoven with several layers, which gives the fabric its insulating property. Being 100% cotton and the weave of Damask being interwoven allows the fabric to breathe. This means it is warm in winter and cool in summer. If one person runs hot and the other cold, the hot cools down and the cold stays warm. This makes for a better, more peaceful sleep. Considering we spend a third of our lives in bed, we should sleep in the best. When you sleep in damask sheets, you will never want to sleep in anything else. Cold wash, line dry, straight back onto the bed. Any marks, napisan and soak (USE AS DIRECTED). Damask is durable and long lasting. Damask is the equivalent to 1000 thread count sheeting. Arabella Sleepwear is a timeless label providing luxurious cotton nighties to customers around the world. Each design has been created to be stylish season after season. A luxurios culmination of the finest cotton and a vision for a line of clothing that brings a comfort and style, we have crafted a beautiful range of pure soft cotton nightwear, finished with fine cotton laces and trimmings. Shop online today or Contact Us about finding your perfect nightie at a local store near you. We also love phone orders. Call Jacqui on 0418 268 703 and place your order. I have always had a love and passion for fabrics, colours, textures and natural fibres. I started sewing when I was 8 years of age. Having spent much of my life exploring fabric, texture, and garment construction, I know natural fibres always feel the best and act as they should. When I started my business in May 1997 I wanted a product I could be proud of, one that was environmentally friendly and Australian-made. I wanted to produce and sell an everyday luxury product that was affordable to almost everyone. This coupled with my love of beautiful fabrics, textures and natural fibres formed the beginning of my wonderful business. Today, Damask Bedlinen Collection sells for about 1/3 the price of other companies. I first started selling my collection at Balmain Market. 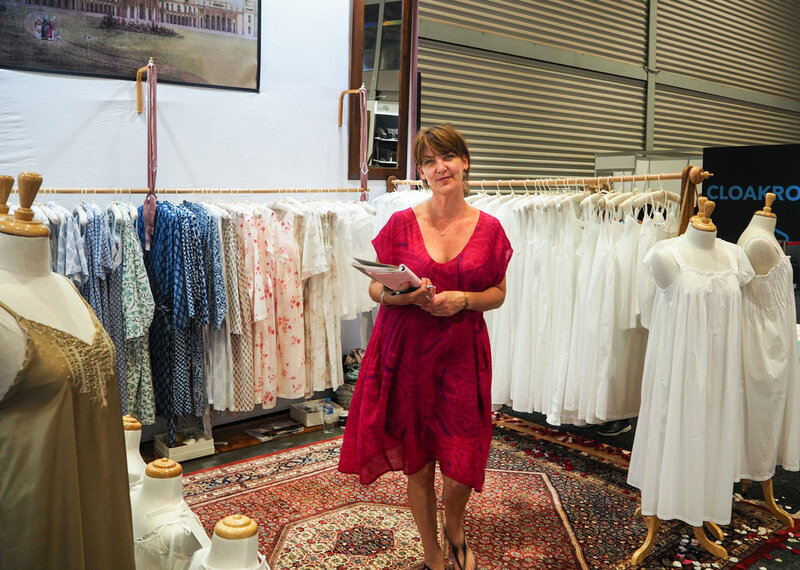 As it proved popular, I soon added Paddington Bazaar, Manly Markets, The Rocks Markets, Bondi Markets, St Ives Monthly Markets, Mosman Markets, North Sydney Markets, Kirribilli Markets, Canberra Bus Depot Markets, Byron Bay Market, and Brisbane Market. I love meeting my customers face to face and I travel across Australia selling the Damask Bedlinen Collection. You may have also seen Damask Bedlinen Collection at regional field days in Mudgee, Bathurst, Dubbo or Gunnedah. I have had stalls at The Royal Easter Show, Canberra Royal, Brisbane Ekka, and Floriade in Canberra. As business grew, I set up my first shop in Ethel Street, Manly (Seaforth) and later opened a flag ship store in Balmain in 2002. Sadly we closed the Balmain store on March 31 2014. Now we sell online through our website (here!) and at our pop-up shop in November, December, and January every year. Like us on Facebook and we can tell you when specials and pop up shops will happen.